Lead designer Alex Hutchinson thinks easy modes represent the "worst possible version" of a game. Recently, the director of Dark Souls was thinking of preparing an easier version of the game to avoid alienating players who were turned off by its extreme difficulty. On the other hand, some team members from Assassin's Creed III are voicing an alternative opinion; they believe that the inclusion of an easy mode often ruins the game entirely. Lead designer Alex Hutchinson claimed in a recent interview that it represents the worst possible version of a finished product. "A lot of games have been ruined by easy modes," he says. "If you have a cover shooter and you switch it to easy and you don't have to use cover, you kind of broke your game." He goes on to state that it is a problem unique to videogames, and he believes that it is the only creative industry to provide difficulty options for its content. He uses literature as an example: "It's like if I picked up a book and it said, 'Do you want the easy version or the complicated version?' (Game designers) can simplify the language, you know; we can make it two syllables." 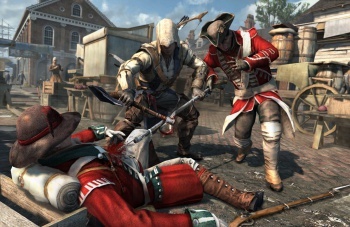 Lead gameplay designer Steven Masters later clarified that, in light of these comments, Assassin's Creed III was not going to be too challenging, revealing that the game was undergoing rigorous playtesting to "fine tune" its difficulty balancing. "We're not trying to make a brutally difficult game, so we go through all the playtest data and make sure it works," he says. Yes, it is true that a game's easy mode can potentially allow players to disregard certain gameplay elements, like taking cover and countering attacks, but giving players the choice to do so is a good thing. After all, not everyone necessarily prefers to suffer numerous defeats before finally feeling a sense of accomplishment.